Pitcher Brandon Parr may have provided one of the biggest highlights of what has been an up-and-down season for the Madison College baseball team. Parr pitched a no-hit 6-0 win against Elgin Community College in the first game of a doubleheader at home on April 14. The no-hitter was the first for Madison College since the 2011 season, when Parker Schrage held Milwaukee Area Technical College hitless. Parr’s no-hitter was the seventh for the WolfPack since 2001. Parr struck out five and gave up four walks and two hit batters in the no-hit victory. With the win, Parr’s record this season improved to 4-1. Madison College now stands at 17-16 overall and 11-5 in conference play, good for third place behind Triton College (12-2) and College of DuPage (11-4). In the WolfPack’s most recent stretch of games, the team has split four doubleheaders and swept one. A six-run fifth inning gave the College of DuPage enough of a cushion that it was able to hold on for a 10-6 victory over Madison College in the first game of a doubleheader on April 17. The WolfPack tried to rally with five runs in the last two innings, but it wasn’t enough. Kian O’Brien had two hits to lead Madison College, while Ryan Makuski and Carson Carmody both doubled. Four runs in the bottom of the first inning helped Madison College bounce back with a 5-1 win in the second game against College of DuPage. O’Brien, Nick Kanavas and Ronnie Cross each had two hits for Madison College. Sam Lund pitched the win, allowing one run on four hits with five strikeouts in six innings. Despite trailing by five runs in the final inning, Madison College rallied to beat Triton College, 16-15, in the first game of a doubleheader on April 16, scoring the winning run on a walk-off walk. Madison College had 11 hits in the game, but got lots of help from Triton College, which made six errors and issued 12 walks. Simon Maurice and Bryce Plate led Madison College with three hits each. The second game of the doubleheader saw Triton College post a 9-5 win by using its power at the plate. Triton had two home runs, a triple and two doubles in the game, taking command with a four-run fifth inning. Madison College was led by Kanavas and Nate Schmidt, who both had two hits. O’Brien added a triple for the WolfPack’s only extra-base hit. Parr’s no-hit pitching gave Madison College a 6-0 win in the first game of its doubleheader with Elgin Community College on April 14. Madison College had seven hits in the game and led by Carson Carmody, who had two hits and a double. Both teams had hot bats in the second game, with Elgin Community College upending Madison College, 16-11. The big boost for Elgin came in the sixth inning, when the team scored seven. Madison College had 15 hits in the game, while Elgin had 16. Kanavas and O’Brien each had three hits to lead the WolfPack. Both of them and Chris Lund also hit doubles in the game. 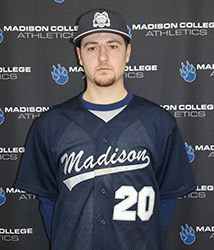 Jake Kopp pitched six shut-out innings to earn his first win as Madison College beat Harper College, 3-0, in the first game of a doubleheader on April 12. Kopp allowed just three hits and two walks while striking out eight. Madison College’s offense took over in the second game of the double header, with 17 hits in a 14-4 six-inning victory. The WolfPack scored in every inning and had five players with multiple hits. Schmidt and O’Brien led Madison College with four hits each. Lund hit two doubles, while Kanavas added another.